Being in the 21st century, our lives can sometimes become overwhelmed with all of the new and exciting technology coming out every year. With all this new technology, it shouldn’t be surprising to find out that some have been developed and marketed for pets and their owners. Below is a list of technology that might pique your interest–and enhance your pet’s life! PetHub – QR coded tags and collars are offered to aid in the process of identifying and helping lost pets find their way back home. Once scanned, the QR code will direct whoever found your pet to the pet’s online profile. The profile contains important information such as the pet’s name, age, breed, possible allergies or health conditions, as well as the owner’s contact information. If they do not have a smart phone, they can go online to the PetHub website or call the lost pet call center using the phone number located on the tag. The company also offers a “premium subscription”, which provides additional services such as the ability to send out virtual lost pet notices, $3,000 emergency lost pet medical insurance, and email notifications that will include a map of where the QR tag was scanned. Whistle – The small device attaches to your pet’s collar and is used to keep track of their daily activities. It can provide insight into your pet’s day-to-day behavior and health trends by recording their walk, play, and rest time. Two of its most interesting features include the owner’s ability to check on their pet using their phone and the ability to send detailed reports to the veterinarian. It also allows the owner to set up weekly goals, monitor their pet’s progress, and compare monthly patterns in their activity. In addition, the device may alert owners to sudden changes in behavior that could be caused by stress, discomfort, or illness. As the amount of data collected increases, the company hopes to provide owners with information about how their dog compares to other dogs using the pet’s breed, age, and weight. Passport Pet Access – This unique pet door utilizes radio frequencies to recognize animals with specific tags and unlock for those that have been programmed to the system. It offers a way to keep track of your pet’s activity and keep other animals or pests out of the house. In addition, the pet door can be programmed so that your pet can only enter and exit at certain times of day. The Passport Wireless Card is programmable for up to 20 pets and permits any smart device with a wireless connection to be used for remote programming. Their website also provides information on how to train your pets to use this new door properly. Pet’s Eye View Camera – Has your cat been up on the roof or climbing over fences? Uncle Milton’s offers a lightweight, compact digital camera that can attach to your pet’s collar and give you an inside look at what your pet’s day is like. The camera can be set up to take pictures at 1, 5, and 15 minute intervals, store up to 40 photos, and has a 15 hour battery life. It is a fun and simple way to find out if your pet is a couch potato or a crazy mischief maker. SpotLite 2.0 – Is your pet always trying to escape? This waterproof, durable GPS tracker is the perfect solution for the dog that is always coming up with new ways to escape the backyard. 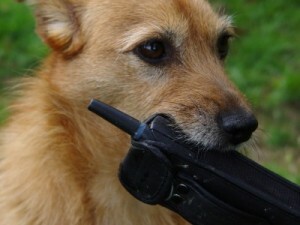 It provides mobile and online tracking so that finding your pet becomes quick and easy. The technology allows you to set up SafeSpots and will alert you when your dog enters or leaves the marked areas. Furthermore, if someone finds your dog they can simply press the “rescue” button and an emergency message will be sent with the dog’s location. In addition to the location services, SpotLite 2.0 includes a lifetime membership to the American Kennel Club companion animal recovery service and access to their recovery support. Go-Go Dog Pals – The Go-Go Dog Pal is a remote operated dog toy that can be used for fun, training, and exercise. The signal can be maintained up to 350 ft away and the car can go up to 25 mph. In addition, it was built to be sturdy so that even dogs that enjoy a little rough play cannot accidentally destroy their new toy. It provides a new and exciting game that can help you bond with your dog while helping your dog get exercise and stay healthy. It currently comes with a gopher painted shell, but the company hopes to offer two new models (a skunk and raccoon) in the near future. I hope that you enjoyed learning about some of these pet devices and don’t forget to keep an eye out for more new and exciting developments in technology for pets–you never know what will come out next.